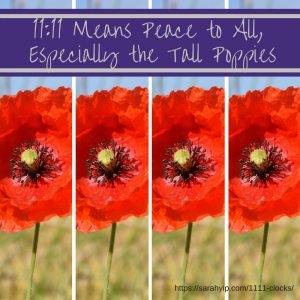 Home11:1111:11 Means Peace to All, Especially the Tall Poppies! For years, I’ve wondered why some people see 11:11, and others don’t. Or why 11:11 appears to me when I’m at a turning point and tackling big challenges. Now, I know. Or find a yoga mat!! When that time arrives, that’s great!